This is a special Collector's Edition release. As a bonus, Collector's Editions purchases counts toward three stamps on your Monthly Game Club Punch Card! Exclusive bonus gameplay, with a new character to play as! 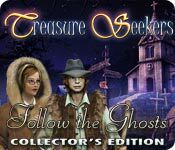 Treasure Seekers: Follow the Ghosts Collector's Edition is rated 3.7 out of 5 by 6. Rated 5 out of 5 by Hookedonbigfish from Great entertaining game This game held my interest from beginning to end. The graphics were great and clear and the puzzles were medium to challenging - a bit of everything really. 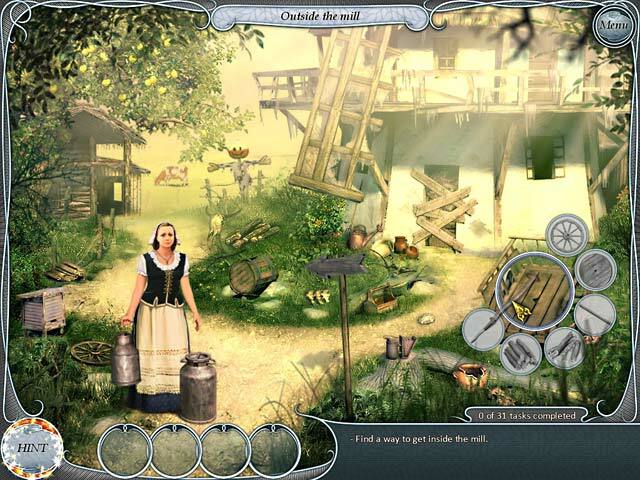 The hidden objects - some were standard and many needed multiple parts to complete the item. I used the inbuilt strategy guide sparingly but the hints a tad more. All in all an intriguing and interesting game with Nellie and Tom helping a number of ghosts to find their peace - well worth a look. Rated 4 out of 5 by AZboyinWI from My first Big Fish game & I enjoyed it I found all 3 games entertaining, although at first I was stumped with no directions given on how to proceed. As pointed out by an earlier reviewer, you do have to "hover" over every inch of the screen to find a clue (magnifying glass) and you had better do it SLOWLY. Once I had completed the first game and had be accustomed to the quirks of the game then, I was able to proceed through the other 2 games. I did find this very entertaining! And will look for more games in the treasure seekers series. Rated 4 out of 5 by hermitcave from Nice beginner game series that got better with each sequel I finally got around to playing the first 3 of this series (visions of Gold, Enchanted Canvases, Follow the Ghosts) and found them good beginner games with puzzles not overly complex and fairly easy to figure out. Many of the HO screens were the wheel style with various items needing to be found and placed in circles until all items were found. One thing I did note was that some of the items were the same such as nails requiring you to find 5 nails and place them one at a time in the wheel circles. If you did not place it in the correct circle, them item returned to where you found it. I discovered that if you drop the item into the middle circle, it will go to the correct spot. This helped a lot when there were a lot of the same items to place. The game is played with a brother and sister duo that seem to wander off either alone or together and search for mysteries and treasure. Usually one gets into trouble and the other has to help find and save them. There is a bad guy (there always is) that wants to take over the world that they have to foil. Overall the games were fun and of reasonable length. Rated 3 out of 5 by bignovice from Exquisite execution yet needlessly frustrating. I better explain rating... after 5 stars for Visual/Sound, Challenge, Storyline and then 1 star for Fun. After playing similar hunt games I have grown intolerant of unnecessarily frustrating and unjustifiably troublesome strategy devices - such as, no fun looking through several rooms for a tool or item only to request a Hint and told to look deep inside a jar or box. This looks like game designer cheating. 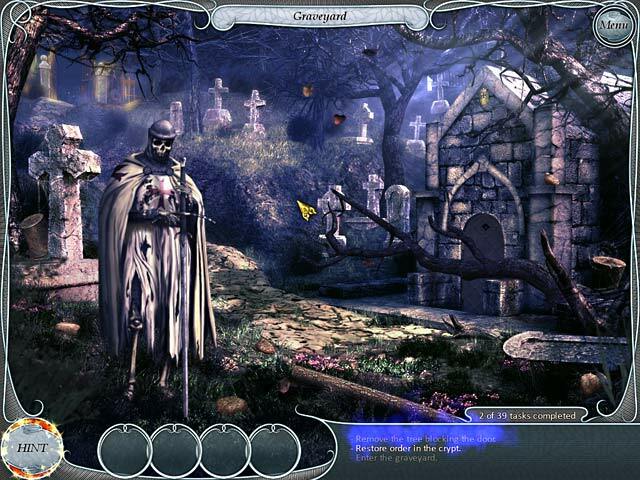 Game style and graphics has tremendous visual quality; even so, I did not find this Follow the Ghosts game fun to play. As a colIector and horder of things, I find each room (basement, library, attic, office) captivating for the objects - so much variety to look at and nothing dainty; very much a man's rooms, even to walls and furniture, sombre colors esp. browns, dark woods, big desks, wall size bookcases, taxidermy, shipping, tools, etc. Since the storyline involves guys, gamewriters made a huge mistake not pairing a guy and younger brother, or detective and male sidekick, since their choice of a pretty female co-hunter shouts PC, adds no drama to plot, and reveals nothing feminine to give her psychological character (thus making her meaningless); similar misstep in laughable cat in office and attic - what guy would ever admit fright of a cat? And why on earth would gamemaker nonsensically have two hunters in fear of such cat in attic run from room to find something obvious to get rid of it? Nonsensical and not a few of that business. My short list of complaints includes: Annoyance from popup windows that broadly overlay and conceal background. Petty peeve for stingy help. Minor gripe over excessive amount of clicks to accomplish a task or move an object. Still a well-done game technically, just not Fun for play. I will recommend it. Rated 3 out of 5 by SeaBamboo from Not too hard & an entertaining game I first played this game back in February 2010 but decided to replay in May 2012; the graphics are still clear but unfortunately the artwork has suffered over the two years; the contrast is not as good as it was & in the hidden object scenes in particular look rather like an overexposed photograph. Still this is a reasonably lengthy game; about 3 hours for me, & was fun to play as there are a 5 different countries to visit & of course the scenery changes with each one. There are no voiceovers & the dialogue is clickable. The hint recharges in 60 seconds on casual mode or 2 minutes on advanced. 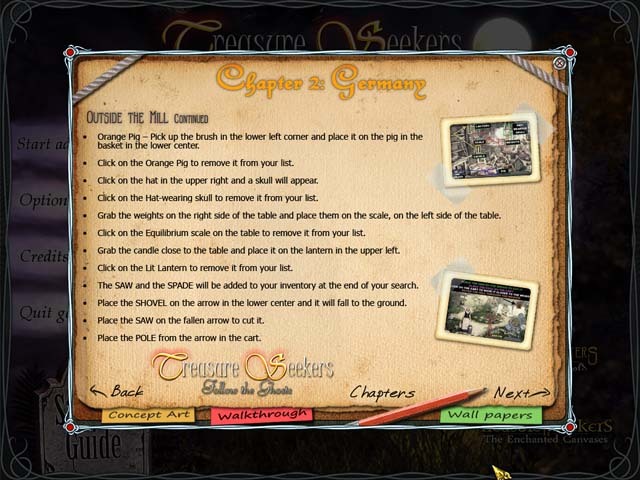 The hidden objects are of two types, there are a few of the normal word lists & the main ones are wheels of pictures within the main scenes, there are some interactive items (more as you play further into the game). The mini puzzles are pretty easy, mostly of the reassemble a picture or a letter type. You do get a task list & this is the main purpose of the game, to find & assemble items to solve the task & eventually move to the next area. The bonus game does not have anything to do with the main game so you will not be deprived of anything if you buy the standard edition rather than the collectors. It only took me 45 minutes to play the bonus chapter so is not worth the extra cost. This is an entertaining game & is not too hard to play. Rated 3 out of 5 by Sweetypuss from Middle of the Road This wasn't a game for me because I don't like it when the game designer/maker simply makes items small or even takes the items mostly out of the scene then wants the player to "hover" over every little inch and wait for the hand icon to light up...nah - this wasn't my cup of tea. Personally, I wouldn't buy this cause I didn't care for the challenges. Now, what I did like about this was the story character "Tom". At first I thought this was suppose to be Tom Sawyer - looks like him, certainly acts like him. Tom is obnoxious which makes me laugh. Everything about the game was "okay" but didn't really entice me into buying it. So, for a Collector's Edition I'm disappointed. HOWEVER, I would buy this on the $2.99 daily sale if it came up just to see what happens and if the sister/wife/cousin (not sure who she is other than bossy) smacks Tom upside his head. Actually, that would make for a pretty good game - every time he opens his mouth, she smacks him with whatever happens to be lying around.